Anaplan wants to promote broad use of its all-purpose planning engine, so it’s changing pricing and promising a bevy of platform upgrades. The only question is which new features will arrive first? It’s all about the platform. That was the message at this week’s Anaplan’s Hub16 event in San Francisco. The company reinforced that message with new pricing and plenty of promised platform upgrades aimed at supporting yet more planning applications and use cases. Before any announcements were made at Hub16, Anaplan had to address the surprise resignation of its CEO, Frederic Laluyaux, just two weeks earlier. It did so by publically thanking Laluyaux for guiding the company from a tiny startup to a bantam-weight cloud competitor in just four years. As for the reasons for the change, it’s not uncommon for fast-growing, VC-funded startups to seek new leaders who can “take the company to the next level” (with MongoDB being a recent example). The company had already brought onboard a new CFO and a new Chief Revenue officer in recent months, both with experience running multi-billion-dollar companies. An analyst town hall with seven top Anaplan executives at Hub made it clear there’s no shortage of talent or experience at the top of the company. Anaplan now has more than 480 customers and 80,000 users, and it’s still growing quickly. The VCs that have invested more than $240 million in Anaplan want to ensure that the leadership is prepared to manage what they expect to become a $1 billion-plus-annual-revenue tech vendor. Anaplan is growing quickly and attracting ever larger customers. The giants in the room at Hub16 included the Kellogg Company and Procter & Gamble. To meet the needs of such companies, Anaplan announced that it has increased the scalability of its underlying Hyperblock engine to handle single models with as many as 100 billion cells. That means Anaplan’s cloud-based platform can handle enterprise-class modeling challenges with fast, multidimensional analysis and drill-down insight into cost and profit drivers across detailed dimensions such as SKUs, stores and markets. Scalability is also about handling dozens of small or average-sized models. Indeed, the crux of the platform appeal is supporting many planning use cases across the business. Unfortunately, Anaplan’s old pricing scheme, which was based on data usage, did little to promote broad use of the platform. Customers found it difficult to estimate costs and capacity requirements, so the hesitated to add new applications. The new pricing scheme is based on per-user subscriptions coupled with Standard, Premium and Enterprise service tiers. The key point is that subscribers can use any app. Customers and partners I spoke to said the new approach is far simpler and more predictable, which is obviously a good fit for a platform that’s designed to make planning easier. Predictive capabilities. Anaplan already has a forecasting application supporting more than 20 statistical methodologies useful for demand planning, sales and operations planning, corporate planning and budgeting and sales forecasting. Anaplan also has Erlang call-center planning functions and constraint-based optimization in use by customers across use cases. At Hub16 the company announced it will add Monte Carlo simulations and multi-variable linear regressions. These additional predictive tools will support workforce optimization, supply planning, transportation assignment, product marketing, and risk modeling among other forward-looking analyses. Social Collaboration. Activity Streams will be embedded in models to support in-context collaboration. These Salesforce-Chatter-like streams will let you follow models with @people mentions and notifications. The streams will run across desktop, Web and iOS, Android and Windows mobile devices with the goal of reducing dependence on email. Application integration. Anaplan has native integrations with Excel and PowerPoint. At Hub we learned that integrations with Google Sheets, Google Docs, Box and DocuSign are coming soon and that AdobeSign and Office365 are on the roadmap. Data integration. Anaplan works with integration partners including Informatica, Dell Boomi, MuleSoft and SnapLogic to help customers get data into the platform. It also has native data ties with Salesforce and is working to add Workday. In response to customer demand, Anaplan announced at Hub that it will add a native data-integration layer to give customers flexibility and tools to link bespoke, custom applications. Model mapping and lifecycle management. A Business Map feature announced at Hub is designed to give customers a holistic view of all planning activity, with tagging, searching and filtering by geography, use case, business process and so on. Anaplan is also promising lifecycle management features that will let customers split large models and synchronize model versions so you don’t have to replicate changes across development, testing and production instances. Anaplan’s emphasis on the platform came through loud and clear, as did its intention to let partners such as Accenture, Deloitte, EY and PWC flesh out domain- and use-case specific apps. Anaplan’s investments are aimed at making the platform as capable and versatile as possible so that customers and partners can build any planning app they can imagine. 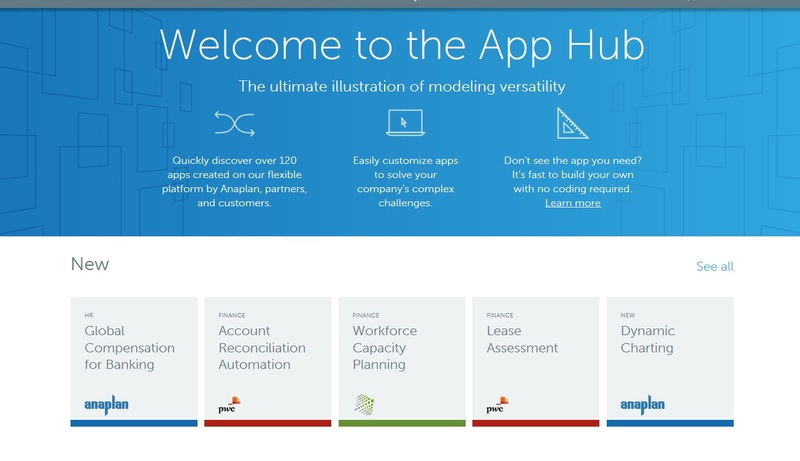 There are now more than 120 apps in the Anaplan App Hub, and the intention is to keep adding more. In June, for instance, Anaplan will introduce a Data Hub app for setting up master data and transaction data that can be shared across multiple planning applications. It will also introduce a U.S. GAAP app for finance that was developed in consultation with PWC. As for Anaplan’s long list of promised upgrades, they all sound promising. If I have one complaint it’s that Anaplan’s roadmap and release dates are rather fuzzy. There were lots of loose, six-to-twelve-month promises that left me with the impression Anaplan was polling customers at Hub and giving itself wiggle room on exactly what it will deliver by when. I’m hoping for a hefty chunk of those planned upgrades will show up in the company’s fall release. The biggest win for customers coming out of Hub16 was clearly the new pricing. The per-user approach is straightforward, and subscribers will be able to use any number of planning applications. Data allowances and access to platform capabilities grow as you move up from Standard to Premium to Enterprise. Premium users, for example, will get access to the predictive capabilities. Enterprise subscribers will have access to higher-level administrative and oversight capabilities, such as the lifecycle-management and Business Map features. In short, Anaplan is investing, pricing and partnering for platform use, and the more planning applications customers and partners can take on, the more valuable and powerful the platform becomes.